After almost 40 years together, Ben (John Lithgow) and George (Alfred Molina) finally tie the knot. They have a beautiful and emotional wedding ceremony in lower Manhattan. However, they return from their honeymoon to find that George has lost his job. As a result, the couple have to sell the apartment they have shared for 20 years. Temporarily homeless while they search for an affordable home in New York City’s relentless real estate market, George and Ben are forced apart. Directed by Ira Sachs, Love Is Strange is a beautiful and understated film about love, relationships and the cruel nature of real estate. With the creation of George and Ben, Sachs has done just that. Their love is heartwarming, their separation heartbreaking. John Lithgow and Alfred Molina are both superb - their relationship is moving and utterly convincing. Sachs explains that he also wanted Love Is Strange to explore “the seasons of life: how we pass information from generation to generation and educate each other as a family”. He achieves this by having Ben stay with his nephew Elliot (Darren E. Burrows) in a small apartment with Elliot’s wife Kate (powerfully portrayed by Marisa Tomei) and troubled son, Joey (Charlie Tahan). Thrown into the middle of their busy lives, Ben finds it difficult to fit in. Is his opinion and experience welcome or should he just keep quiet? Lithgow portrays this struggle perfectly - what is unsaid speaks volumes. Indeed, Sachs’ camera is often a silent observer - with no need for dialogue, we understand the emotions at play beneath the “polite” surface. 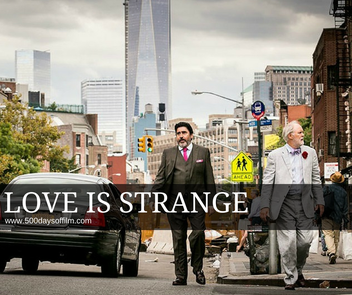 Love Is Strange is gorgeous to look at (with stunning cinematography from Christos Voudouris) and is also pretty wonderful on the ear. Ben is a music teacher and the piano score that accompanies this film adds much to its poignant atmosphere. While on paper Love Is Strange may seem small and understated, Sachs’ beautiful and beguiling story - with its powerful and universal themes - lingers long in the mind. Have you seen Love Is Strange? If you have, what did you think of this film? I would love to know… why not leave me a comment in the box below.